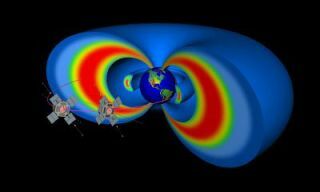 The two RBSP spacecraft will help study the Van Allen Radiation belts that surround Earth. The planet is surrounded by two gigantic, fluctuating donut-shaped zones made of protons and electrons known as the Van Allen radiation belts. The charged particles in these zones can damage sensitive electronics on spacecraft such as those used for global positioning systems (GPS) and communications and can injure humans in space. "Probably the most interesting thing to me about the radiation belts is how variable the region is," physicist Robyn Millan at Dartmouth College told SPACE.com. "During geomagnetic storms, we see charged particles accelerated to really high, relativistic energies, traveling near the speed of light. The number of these particles can increase by a factor of 1,000 in a day or less. We don't often think of Earth as being an efficient particle accelerator like exotic objects such as black holes or supernovae, but it is, and it is right in our own backyard, so we can really study the processes in detail." To better understand these radiation belts (and perhaps diminish those risks), scientists are deploying both satellites and balloons. NASA's Radiation Belt Space Probes (RBSP) mission is set to launch two spacecraft in 2012 to sit in space above the equator and look at charged particles concentrated along magnetic lines there, which rain down into the atmosphere following magnetic field lines to their base at the poles, and produce X-rays. "One of RBSP's main challenges will be to differentiate between the hordes of theories that try to explain why the belts wax and wane over time," researcher David Sibeck, the project scientist for RBSP at NASA's Goddard Space Flight Center in Greenbelt, Md., said in a press release. At the same time, Millan will head a project called BARREL, or Balloon Array for RBSP Relativistic Electron Losses, which will measure those X-rays with two campaigns of 20 balloons each scheduled for launch from 2012 to 2014. They are designed to be launched roughly once every other day, and stay aloft for five to 10 days, scanning a huge area in the sky. When an RBSP probe detects something interesting, BARREL can give feedback on where the particles went. With such teamwork, researchers can measure how many particles get kicked out of the belts and how far they go, thus determining how big an effect different phenomena have. "That's something we would have more trouble doing with the spacecraft," Sibeck said. The first test of BARREL started in 2008, involving payloads weighing only 50 pounds (22 kilograms) using balloons about 90 feet (27 meters) wide. Although such balloons might sound large, many scientific balloons typically launched in Antarctica are the size of a football field and carry payloads of some 3,000 pounds (1,360 kg). The final test of BARREL's balloons took place last December. "We just had to pull them out of the box and turn them on," Millan said. "We mounted their solar panels and with just two people we were able to get things ready really fast, which isn't always the easiest thing to do when in Antarctica." This past December, it took longer than normal for the winds circling over the poles to set up. As such, the first balloon that was launched floated straight north towards Tasmania. Moreover, it might have had some kind of leak, bobbing lower every day and never quite making it as high as its intended altitude of about 120,000 feet (36,576 meters). Still, every day for five days the balloon doggedly climbed to roughly 112,000 feet (34,137 m), earning it the nickname, "The Little Balloon That Could." It "even sent back some interesting data as it flew through an X-ray aurora," Millan said. A second balloon did hit the right wind current, successfully transmitting data. Once each balloon is launched, it moves slowly by floating in the wind, and those on the ground cannot control it other than with a single command to end the mission. This detonates a small explosive that cuts the balloon's cable to the payload, which then floats down to the ground on a parachute. This was the fate of both test balloons launched in December, although they were sorry to cut down the Little Balloon That Could. "The test flights were really helpful -- we had the opportunity to exercise the system through a range of temperatures. We also found a new kind of problem that could arise with our flight battery, so now we can build some protection into the design to prevent that from happening again," Millan said. "This is one of the great things about balloons -- it is relatively cheap to launch them, so you can do these kinds of test flights." In addition to NASA's RBSP satellites, other spacecraft also flying during the BARREL campaigns might coordinate with the balloons, such as NASA's THEMIS mission, which is investigating activity in Earth's magnetic field; Canada's ORBITALS mission, which is analyzing space radiation; as well as Japan's ERG satellite and Russia's RESONANCE mission, which are both aimed at studying Earth's inner magnetosphere. "Even though the radiation belts were discovered in the late '50s, we have not had a recent dedicated space mission to study the detailed physics going on there -- now we get to launch our balloons at just the right time, when a constellation of spacecraft are out there making high-quality science measurements," Millan told SPACE.com. The research has offered plenty of students a chance to get involved. "We have had one high school student, 14 undergraduates, and eight graduate students involved already," Millan said. "They have helped design and build hardware, conducted operations, have made presentations about the project and will participate in analyzing the science data. I think this is really important for training the next generation of scientists and engineers and for inspiring excitement about science," she said. "After all, it is really fun to launch balloons!"